BEFORE YOU BEGIN: Take a moment to review the FAQ and Settings Reference as these will help you avoid some common mistakes and help you understand some of the basics of our gift registry software. Both of these pages are linked throughout this tutorial. STEP ONE A: Gift Registries, Wish Lists, or Both? Our gift registry software is capable of supporting different types of gift registries. Before we start, the first thing to do is decide if your gift registry software is going to allow Dated Gift Registries, Wish Lists, or both. What's the difference? A Dated Gift Registry is a gift registry that is setup for a specific event such as a Wedding, Anniversary, Baby Shower, or other event. This type of gift registry will remain active in the system for the number of years after the event date (1 to 5) that you can select in the settings section of the administrator. A Wish List is an open-ended type of gift registry that has no specific event or ending date associated with it. Your customers will be able to add, edit, or delete gift items on their wish list for as long as you allow. Wish lists can be deleted within the administrator at any time. To select which type of registries you will allow, sign in to the administrator and click the Gift Registry Management option in the administrator's left menu. This will open the Gift Registry Management panel. 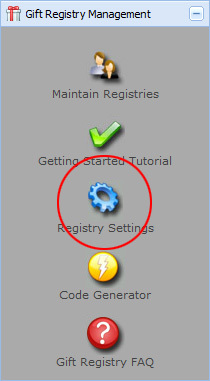 Then, click the Gift Registry Settings icon in the Registry Management panel. Choose which type of gift registries you wish to offer and click the "Save" button in the toolbar. This will change the text and links throughout the gift registry software to match the choice you have made. The first thing you will need to do is copy the HTML link to the New Gift Registry Form and paste it into a page on your web site. 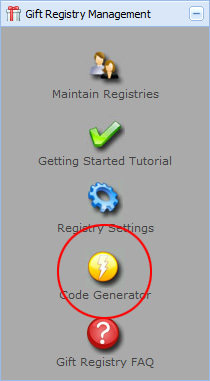 Back on the administrator main menu, click the Code Generator icon on the Gift Registry Management panel. FAQ: Do I have to use http://apps.agenne.com or can I use a custom URL? You may specify and use your own custom sub-domain such as http://registry.MySiteURL.com (where MySiteURL is the basic domain of your web site). You can then point your custom sub-domain to one of our servers. To set this up, please contact Agenne Support for assistance. 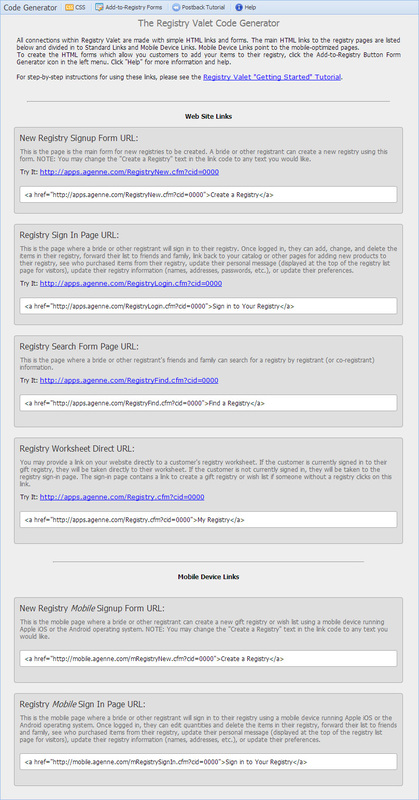 NOTE: The custom sub-domain URL feature is not available with the free "Starter" version of Registry Valet. You must be using at least the "Basic" version to use a custom sub-domain. Now, go to your HTML page that contains this link and click on it. The Create New Gift Registry page will be displayed and will look something like this. 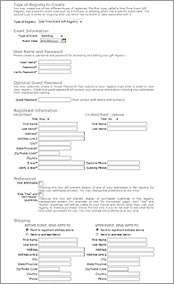 Note that this form is extremely customizable. Many of the elements of this form are optional and can be controlled by turning them on or off within the Registry Valet Administrator software. The form you see here is in its basic, uncustomized state. For example, the software allows for 2 optional shipping addresses in addition to the registrant's main address. These addresses are for shipping before and after the event (event-based gift registries only). If you don't want your gift registry form to include these additional addresses, simply turn them off in the administrator. By using settings within the administrator software, uploading your own background wallpaper, and by using Cascading Style Sheets to customize virtually every element on the page, you can make your gift registry software look very much like the rest of your web site. Now, create an sample gift registry by by clicking on the link you just added to your web site and filling out the "Create New Gift Registry" form. This will give you a sample gift registry or wish list that you may use for testing. While in test mode, you may create up to 10 live gift registries or wish lists. The 10 gift registry limit will be removed when you go "live". If you now go to the sign in page, you will see that it contains all of the same customizations that you applied to the Create New Gift Registry page. By applying the customizations, all gift registry pages will reflect the same look and feel. This allows you to create a very consistent look throughout the gift registry software. As a result, the gift registry software will not function correctly. Always avoid using iframes when creating a custom design. Our applications allow maximum flexibility for design so you should not need to use iframes anyway.